Jo's Favorite Things: Happy January 14! It's cold but sunny outside today in Chicago, Illinois. The days are actually getting longer even though it still seems pretty bleak outside. The sun rose this morning at 7:16 a.m. local time and it will set at 4:43 p.m., one minute later than it set yesterday in Chicago. We have a total of one minute and thirty two more seconds of daylight than we had yesterday. Altogether, we have added back 19 minutes and 40 seconds of daylight since the Winter Solstice on December 21st. Seattle? New York City? Other Cities? Seattle, Washington, is just a bit farther north than Chicago. Whereas Chicago has over 9 hours of sunlight today (9 hours and 27 minutes to be precise), Seattle only has 8 hours and 50 minutes of sunlight today. And New York City, slightly south of Chicago, has 9 hours and 34 minutes of daylight, about 7 more minutes of daylight than Chicago. You can search for your city HERE at the sunset/sunrise lookup of the TimeAndDate site. Not sure where this gorgeous photo came from, but it is a perfect expression of the beauty of winter. How Many Days Until Daylight Savings Time Comes Back? One of my friends has been counting down the days until we return to Daylight Savings Time and get back an hour of evening light. I can't say that I blame her at all. That will happen on Sunday, March 11, 2018, 56 days from now. Sunset in Chicago, today at 4:43 p.m., will jump to 6:52 p.m. and we will have 2 hours, 15 minutes, and 4 seconds more daylight in total than we have now-- and 2 hours, 35 minutes, and 44 seconds more daylight that we had on the Winter Solstice. 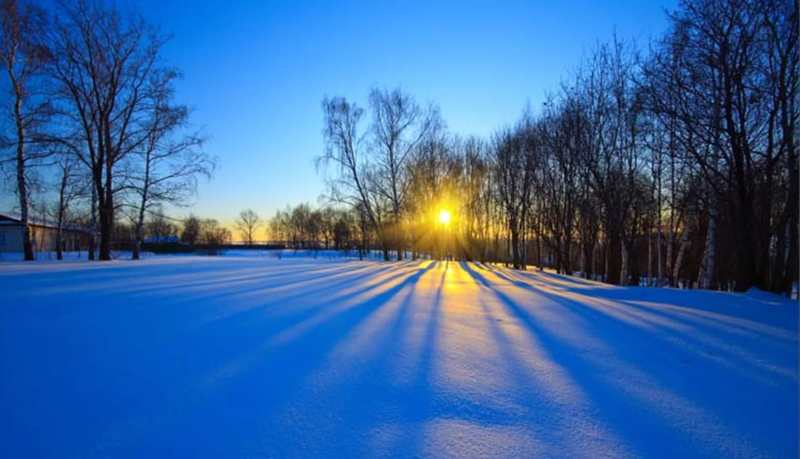 Did you know that the earliest sunset of the year is NOT on the winter solstice? In 2017 in Chicago, the earliest sunset of the year happened on December 8th, almost two weeks before the solstice on December 21st! HERE's an explanation. Other than those precious few minutes of sunlight, what else is noteworthy about January 14th? Check out the (somewhat) famous people born on January 14th. Some of these names may be familiar; some may not be familiar at all. There are more people born on January 14th at the link above.